This isn’t for everybody but on extremely varying terrain, some people find that the close jumps of 11 and 12 speed cassettes mean that every time they shift, they need to go 3 or 4 clicks at a time. The ratio I came up with is as follows: 12-14-17-21-25-30-36-42-49. That way, the percentage jumps are fairly even at 17%-21%-23.5%-19%-20%-20%-17%-17%. Slightly tighter ratios toward the end so its easier to settle into climbing pace because of the mountainous area we happen to live in. 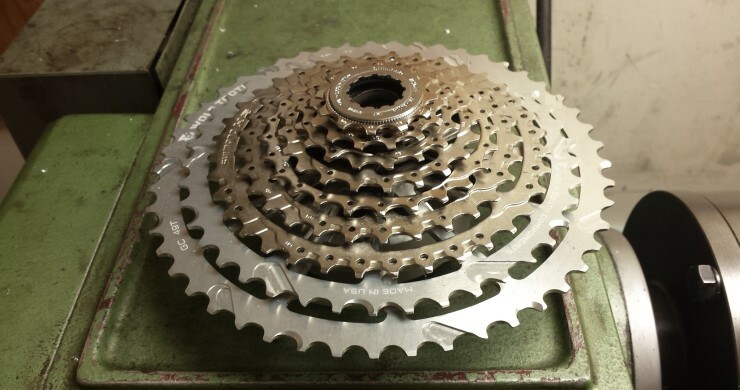 There are a few other pluses of using 9 speed over 10, 11 or 12. We live in an area with crappy weather most of the year and it really has a way of ruining shifting performance due to grime and corrosion. 9 speed has wider spacing so fine adjustment isn’t as critical since the amount of derailleur movement is larger between cogs. Same goes for cable movement for every click of the shifter. The first six gears on this thing are taken from Shimano cassettes and the last two are 7075 alloy Wolftooth cogs with spacing modified for 9 speed. To get this thing to work, you can use any old Sram 9 speed shifter with an Eagle or GX Eagle derailleur. No need for an XD driver, just an old HG freehub is fine.